Diamonds are one of the crystalline forms of carbon, the hardest substance known. The name "diamond" comes from the Greek "adamas," meaning "invincible." 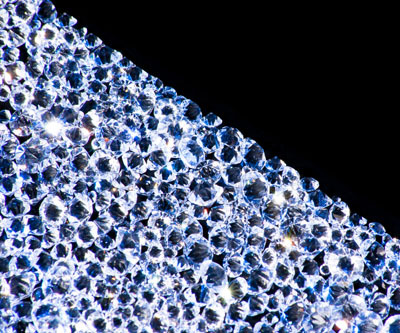 Diamonds were formed billions of years ago, deep within the earth. They are created when carbon is put under immense pressure and temperature deep within the earth, at distances of 250 miles or even greater. Only a small number have survived the incredible journey to the earth's surface, which began several billion years ago. The history of diamonds begins on the Indian sub-continent, where alluvial diamonds were collected as far back as 800 BC. There exists no evidence that diamonds were known prior to this date, and they may actually post-date the year 800 BC. A stone that may be diamond is recorded in the Bible and in documents left by the ancient Greeks. Diamonds have inspired mystery and have been the source of legends from earliest antiquity until the present day. It was said by some that they were the tears of the Gods. The ancient Greeks believed that diamonds were splinters of stars fallen to the earth. In China, people believed that diamonds could thwart evil spirits, and they became a symbol of strength, courage and invincibility. Roman Pliny the Elder wrote that swallowing a diamond would neutralize poison and guard against insanity. Another legend tells the story of The Valley of Diamonds, an inaccessible valley in Central Asia carpeted with diamonds, "patrolled by birds of prey in the air and guarded by snakes of murderous gaze on the ground." This Hellenistic legend was allegedly brought west after Alexander the Great (356-323 BC) conquered Persia and invaded what is now northern India. As well as being the subject of legend, diamonds have always been a symbol of elegance, wealth and love and can add glamour and beauty to women. Unfortunately, diamonds are also a root cause of terrible tragedies, a reason to terrorize millions of innocent civilians. Brutal atrocities during Sierra Leone's civil war attracted the gaze of the outside world. It is hard to believe that people were tortured and that children were taken from their homes, forced to become soldiers and made to kill their parents, brothers, sisters and friends. Blood diamonds, or "Conflict diamonds," are stones that are produced in areas controlled by rebel forces that are opposed to internationally recognized governments. "Blood diamonds are gems that have been used to fund rebel groups in wars in Africa, leading to more than 4 million deaths and millions more people displaced from their homes, "explains a joint statement from Global Witness and Amnesty International." Conflict diamonds were brought to the world's attention by the media during the bloody civil war in Sierra Leone in the 1990s. According to Human Rights Watch, over 100,000 people were killed and over one million people displaced. Ambassador Juan Larrain, Chairman of the Monitoring Mechanism on sanctions against UNITA said: "It has been said that war is the price of peace… Angola and Sierra Leone already paid too much. Let them live a better life." The Kimberley Process, otherwise known as the Kimberley Process Certification Scheme (KPCS), was established in 2003 to prevent the trade of diamonds that fund conflict. The trade in these illicit stones has fuelled decades of devastating conflict in countries such as Angola, Cote d'Ivoire, the Democratic Republic of Congo and Sierra Leone. The Kimberley Process is an international governmental certification procedure which requires each nation to certify that all rough diamond exports are produced through legitimate mining and sales activity. All rough diamonds exported from these nations are to be accompanied by certificates that state that the diamonds were produced, sold and exported through legitimate channels. Rough diamond caches have often been used by rebel forces to finance arms purchases and other illegal activities. Neighboring and other countries can be used as trading and transit grounds for illicit diamonds. Once diamonds are brought to market, their origin is difficult to trace and, once polished, they can no longer be identified. In order for a country to be a participant in the scheme, it must ensure that no diamonds finance a rebel group or other entity seeking to overthrow a UN-recognized government, that every diamond export be accompanied by a Kimberley Process certificate and that no diamond is imported from, or exported to, a non-member of the scheme. After rough diamonds are mined, they are transported to Government Diamond Offices and the source of the diamonds is checked to ensure it is conflict free. The diamonds are then sealed and placed into tamper resistant containers and issued a government-validated Kimberley Process Certificate, each bearing a unique serial number. There are 74 countries that have implemented the principles of the Kimberley Process and have it enshrined in their national law. Only these countries may legitimately export rough diamonds. Diamonds can only be imported legally into one of the 74 Kimberley process countries. Once diamonds are imported, the government customs office, in conformance with its national procedures, checks the certificate and seals on the container. Any rough diamonds without a government-validated Kimberley Certificate or that are unsealed are turned back or impounded by Customs. Once a diamond has been legitimately imported, it is ready to be traded, cut and polished and set into jewelry. Several companies may be involved in this process. Each time the diamond changes hands it must be accompanied by a warranty on invoice stating that the diamond is not from a conflict source. This is called the System of Warranties. Manufacturers/traders are required to audit these System of Warranties statements on their invoices as part of their annual audit process and to keep records for 5 years.